Animals face stress and emotional trauma just like we do and Reiki can be just as helpful for them. Not all animals accept energy healing (the first time they feel the energy it usually freaks them out a bit) but when they do it provides them with the same benefits as it does for humans. In many ways, energy healing can be more helpful for animals than for humans. Frequently the degree of healing a human gets from an energetic healing session is mitigated by rational or logical thought. We tend to obsess or worry over situations and relationships and overthinking things can impede progress as far as keeping those energy paths clear. But animals don’t use logic. They just act/react to a situation and then move on. They also tend to be more sensitive to energies in general and most accept energy healing without any issues, though it does usually take some time for them to get used to it. Reiki is a Japanese word combination that roughly translates to “Universal Energy”. Reiki used in the context of a healing modality refers to a practitioner utilizing this energy to identify areas where the energy in a clients subtle bodies (the emotional and energetic bodies that surround our physical bodies) is sluggish or blocked. Once those areas are identified, the practitioner uses the Reiki energy to clear any blockages and restore a balanced flow. I have been dealing with energies for over 10 years and completed Reiki training, earning my Master’s Level certificate, in early 2013. I incorporate Reiki as needed into the energetic healing sessions I perform as part of my practice. I also work with the energies from crystals and singing bowls and use crystal, sound, and aroma therapies to enhance energetic healing sessions as needed. Shortly after completing Reiki training, I came to the conclusion that working in a corporate environment was taking too much of a toll on my health and sanity so I decided to quit my engineering job after nearly 30 years and put my training and skills to use helping others with energetic healing. This also gives me the time to move my line of herbal bath and body products forward and I’ve already begun adding new products. In addition to offering energetic healing sessions, I work with the energy of sacred geometry and color to create grids based on the Mayan Light Language. These grids can be quite powerful and are an excellent support system for any positive change we want to make in our lives. In addition I generate natal charts (birth charts) and comprehensive astrological reports based on those charts. 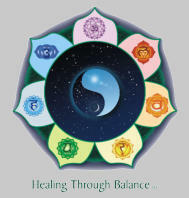 If you’re interested in receiving any form of energy work, please check out my page at Healing Through Balance ... just click on the logo to the right. You can also visit my online shop by clicking the button below.